Launched in 1977, the Voyager space probes are further from Earth than any human-made object ever built. Using the Hubble Space Telescope, astronomers have charted a roadmap for the probes, revealing surprising details about their ongoing journey through interstellar space. Incredible as it may seem, both Voyager probes are still collecting data and transmitting their findings back to Earth. They have about a few decades of electrical power left, after which time they will go dark. In the meantime, scientists can study the information collected by the Voyagers, and compare these findings to data gleaned by the Hubble Space Telescope. But even after Voyager 1 and 2 expire, astronomers can still use Hubble to study the environment through which these dead probes are expected to sail. Astronomers from Wesleyan University recently used the Hubble Space Telescope to scan the regions of space within which the probes are expected to travel in the coming years. This vast area between the stars, known as the interstellar medium, contains debris left over from ancient supernovae, and scientists are eager to learn more about it. The latest findings, which were presented this past Friday by astronomer Seth Redfield at a meeting of the American Astronomical Society, reveal a rich, complex interstellar ecology that includes numerous clouds of hydrogen laced with other elements. Interstellar space, as Hubble and the Voyager probes are revealing, is more than just an empty expanse. "The Voyagers are sampling tiny regions as they plow through space at roughly 38,000 miles per hour [61,155km/h]," noted Redfield in a statement. "But we have no idea if these small areas are typical or rare. The Hubble observations give us a broader view because the telescope is looking along a longer and wider path. 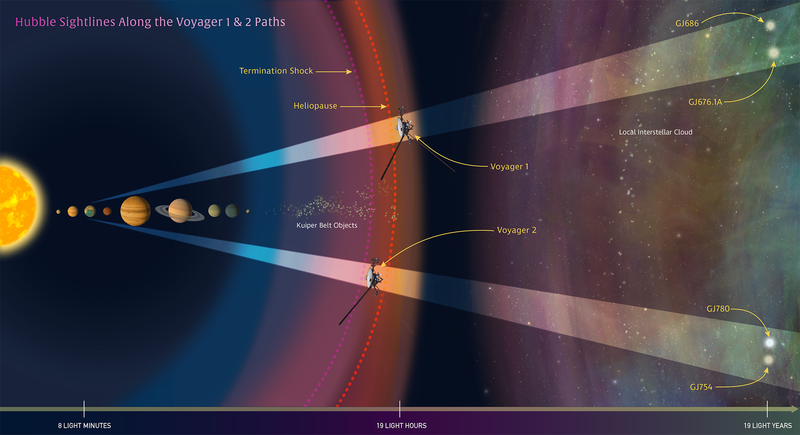 So Hubble gives context to what each Voyager is passing through." Both probes were launched in the same year, but they're currently on two very different journeys. Voyager 1 and 2 are 20.9 billion and 16.8 billion km from Earth, respectively. In 2012, Voyager 1 pierced through the outermost edge of the Sun's heliosphere, known as the "heliopause", becoming the first human-built spacecraft to enter into interstellar space. 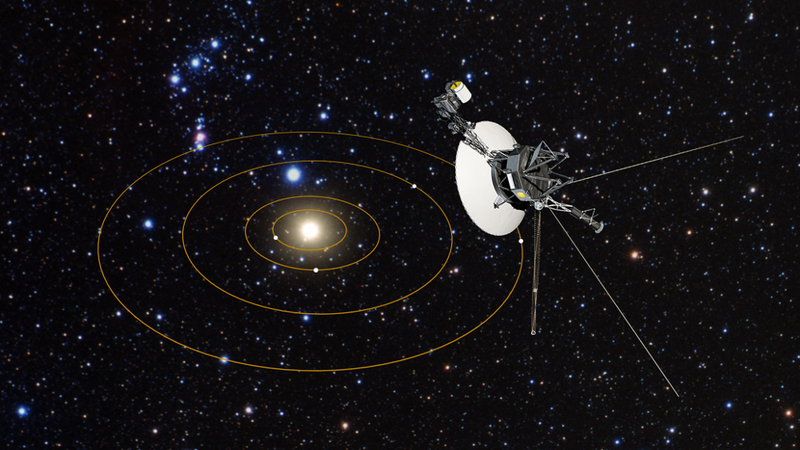 Voyager 2 is a tad behind its twin, currently passing through the outer reaches of the heliosphere. Over the next decade, and while both probes are still operational, they will be making measurements of interstellar material, magnetic fields and cosmic rays. Redfield's team used Hubble to gaze directly at two sight lines along each spacecraft's path, in order to map the interstellar structure along their respective routes. In 40,000 years, Voyager 1 will pass within 1.6 light-years of the star Gliese 445, and Voyager 2 will pass 1.7 light-years from the star Ross 248. The researchers found that the probes will successively move in and out of various interstellar environments along their journeys. For example, Voyager 2 will eventually move out of the interstellar cloud that surrounds our solar system, spending 90,000 years in a second cloud before passing through a third interstellar cloud. Each of these clouds contain different chemical signatures, suggesting they formed in different ways, or from different areas, and then converged. From there, the fate of the Voyager probes is anybody's guess. Hundreds of thousands or even millions of years from now, the probes could enter into a star system and become trapped in its gravity well. Or, as portrayed in the first Star Trek movie, one of them could be intercepted by an alien intelligence.